Today we helped our Ugandan brothers and sisters complete a variety of necessary tasks on the land. In the garden, we constructed a composting system comprised of 10 carefully laid out mounds, using grass clippings and other natural resources that we collected from our property. The compost will enhance the nutrients of the soil, which will increase the efficiency and productivity of our agricultural undertakings. The grass clippings were provided by Francis and Cameron, who used hand scythes and a little bit of muscle to trim the overgrown parts of the property. The scythes provide an alternative to traditional, commonly used grass-slashing machetes, which require farmers to bend over and strain their backs for long periods of time. The scythes are much faster, more efficient, and easier to use. They can also be replicated. We strive to ensure that all of our efforts on the land not only improve the work being done, but also that they are sustainable and duplicable, meaning that everyday Ugandans can adopt what we do and the tools that we use. 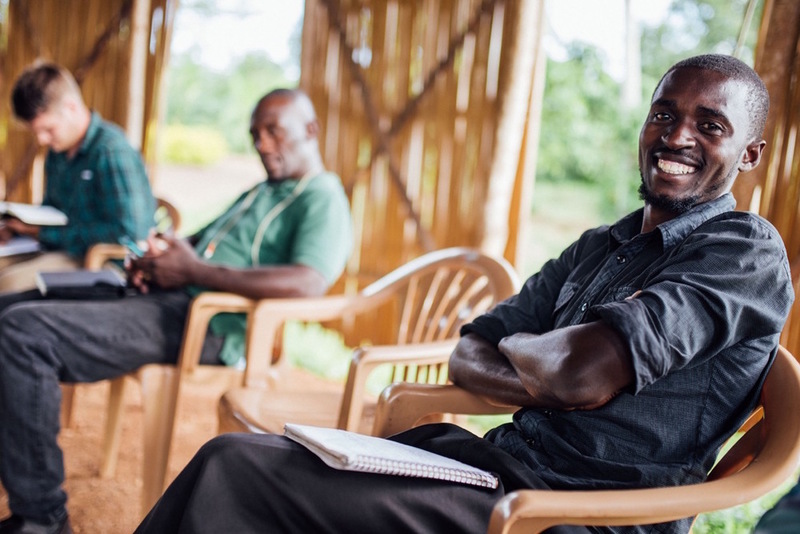 In addition to work in the garden, Derek assisted our cooperatives who teach at St. John’s Primary School to make preparations for their upcoming classes, and Cameron facilitated multiple meetings intended to ensure the quality of work being done on the land. Cameron Kagay uses a scythe to clear our land that is rapidly growing during the rainy season. We introduced the scythe last summer, and they have been using it faithfully since. Tom Mayinja has been working as a builder under Francis Lubega for the last five years. Now, he is also a student at the Institute for G.O.D. East Africa. Kagay, Bargatze and Montgomery listened to Institute students give final oral presentations. Moses Kigozi just completed his education to be a certified electrician, thanks to a scholarship from G.O.D. Int'l. He is also now a student at the Institute for G.O.D. East Africa. Perhaps the most powerful moment of the day for me was in the evening. When all the physical tasks were done and the sun was setting, we sat in on the students giving their final oral presentations for their Christian Development class at the Institute for G.O.D. East Africa. This class covers psychological and developmental concepts related to living in a community of faith and choosing a life of vocation. We watched them articulate the academic concepts of the class textbook, and apply those concepts in the study of biblical characters. While most of our students had several college options available to them in the city and chose our school instead, a few others would not have had the opportunity to take a class like this, were it not for our program. One such student, Tom, dropped out of school at a young age in order to support his family. Now, he has been given the opportunity to develop his mind as well. He has been able to take classes alongside making a living working on our land, and he is succeeding, with a lot of hard work. With extra help given to him in regards to reading and literacy, he is doing his best, and has now completed his second college course.